This article was sponsored by New Relic. Thank you for supporting the companies who make SitePoint possible! Analyzing the performance of your web application is important. There may be bottlenecks that are affecting a certain group of users or there might be errors that haven’t been identified in testing. Often, an application won’t react the same in development or staging compared to the production environment, where 1000s (or more) users hit it concurrently. When the nuances of your production environment show up, you’ll want a way to measure what’s happening. Which requests are slow or falling over? Is there an external system you’re using that is clogging the pipes? Are your users happy or frustrated? Real time performance monitoring is the only way to find the answers to these kinds of questions. In this article, we’ll look at one way to get those answers. Traditionally, setting up some form of monitoring for an application was difficult and time-consuming. New Relic is an analytics software as a service that provides performance data about your Ruby (or node or .NET or just about any kind of) applications in real time. This allows you to monitor the overall performance and health of your application and keep on top of it’s performance. Once you have gathered the metrics and analized the charts; you can start to optimize the code and performance of the application based on that feedback. Because it works in real time, New Relic will also help to identify any new problems that are caused when you deploy an update to your application. A big advantage of using New Relic is that all the data is based on real usage of your application and is presented as it happens. New Relic works by inserting Rack middleware between the server and your application that collects data that is then sent back to the New Relic server. You might be concerned that this in itself creates an ironic performance hit, but it actually makes such a small difference that it isn’t noticeable. The gains from the data collected far outweigh the tiny delay caused in collecting them. New Relic started life as a Ruby application, so it has very good all around support for different versions of Ruby. It supports all versions of MRI from 1.87 upwards, JRuby from 1.6.0 upwards, and Rubinius from 2.2.1 upwards. There is also good support for most Ruby Web servers, including Passenger, Thin, Puma, Unicorn, Rainbows!, and Webrick. You can use Rails, Sinatra, Padrino, or just a simple Rack application. Database support is also excellent, with Active Record, DataMapper, Sequel and MongoDB all supported. 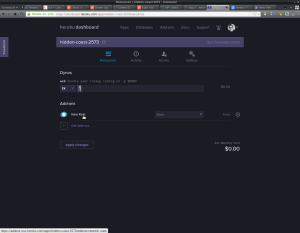 If you don’t want to deploy your application using Heroku then you can simply go to https://newrelic.com/#signup and sign up for a free account. Once you’ve registered, you’ll be taken to the start page where you follow the instructions to get started. You can also just as easily use a Rails application or any other Rack based framework instead of Sinatra. These are fairly standard specs, using MiniTest, to test a very basic response. Now let’s create a file so that these tests pass. Finished in 0.086612s, 11.5457 runs/s, 23.0914 assertions/s. This will install the Stark plan, which includes all the features but is limited to an average of 1.5 dynos per month (you can upgrade to a paid for plan whenever you need to). 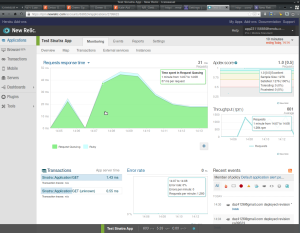 $ heroku config:set NEW_RELIC_APP_NAME="Test Sinatra App"
To view the New Relic interface, you will have to go through the Heroku website: Select the application you installed the New Relic addon to then click on New Relic in the List of Addons. The New Relic interface will then begin to load. This dashboard shows all the basic information about your application. Unfortuantely, there is not data to show at the moment because the application hasn’t received any requests. Obviously, you should substitute the URL of your own application here! There is a lot of informaton presented here and it can be quite daunting at first. We’re going to start by taking a look at some the basic statistics, such as Response Times, Throughput, Apdex Score, Error Rate and Recent Events. The dashboard defaults to showing statistics for the last 30 minutes, although this can be changed by clicking on the the button in the top right corner that says ‘Last 30 minutes’ and selecting another timeframe. 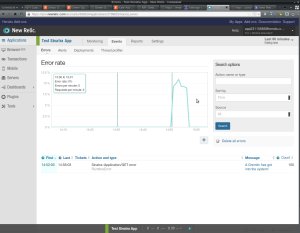 On the Monitoring Overview screen you can see the average request time as a line chart in the top left corner. You can hover, click, and drag anywhere on this graph to get more informaton and zoom in. As you can see in the screenshot, our application currently takes between 10ms and 50ms to process each request. Throughput is shown on the middle right of the dashboard and represents the number of requests per minute that our application can handle. 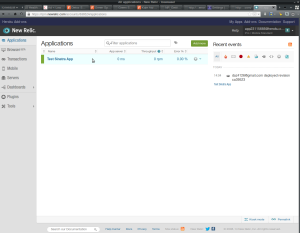 Looking again at the screenshot above, our application is handling between one and two thousand requests per minute. Our pageload time is very quick, giving us an excellent Apdex score. The Error Rate is shown in the middle bottom of the dashboard and at the moment we are doing well as this is at 0% – no errors at all! One of the most useful things about NewRelic is that you can make changes and immediately see the effect of them. To see this in action, let’s add another route handler that has a random delay built in. This will make the pages take a little longer to load and we should see the changes reflected in New Relic. last_response.body.must_equal "Sorry for keeping you waiting"
This code will add a random delay between 0 and 3 seconds before dispalying the message. Finished in 1.140616s, 1.7534 runs/s, 3.5069 assertions/s. This will take a bit longer than before (because of the built in delay we have created). First of all, notice the vertical line on the line graph – this marks when our deployment was made. The deployment also appears as an entry in the ‘Recent events’ column in the bottom right corner. We now see that the request time is much longer than before. The graph is broken down into two parts – green for request time and blue for Ruby processing time. The big block of blue tells us that the delay is being caused by Ruby, rather than the server. The throughput is now down to between 200 and 500 requests per minute and this has resulted in our Apdex score taking a hit with some of the requests being classified as ‘Frustrated’. A warning will also appear in the Recent events column to say when the Apdex score falls below 0.85. What’s great about this is that we can see the affect our changes have had immediately after the code has been deployed. We still have zero errors though, which is something we’ll address in the next section. raise "A Gremlin has got into the system!" This will raise a random error 1 in 10 times. Finished in 0.105132s, 28.5355 runs/s, 57.0709 assertions/s. We can see that the error rate has climbed to 9.71%, which is what we’d expect. Also, an entry in the Recent events column says that the error rate has gone over 5%. While in the ‘Events’ section, try clicking on ‘deployments’, where you can view a breakdown of all the statistics for each deployment. 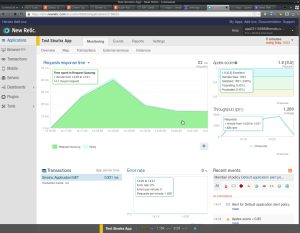 New Relic is able to generate a number of reports to summarise the application metrics. If you click on the ‘Reports’ tab along the top then select ‘SLA’ you can see a ‘Servie Level Agreement’ report that will tell you how many requests have been made per day, what the Apdex score was, the error rate and how many users were satisfied, tolerating, or frustrated. That completes this tutorial about how to deploy a basic Ruby application to Heroku and use New Relic to monitor its performance. We’ve looked at how to meaure the response time, throughput, and the Apdex score, as well as how to see changes in these metrics in real time after deploying a code update. New Relic identified the errors in our application, as well as how slow page load times were being caused by Ruby, rather than the server. The really useful thing about all of this information is that it coming from a live, running application – notice that our application passed all of the tests we ran, despite there being some bugs lurking underneath that we’re only picked up under repeated usage. Custom Dashboards are a powerful feature that allow you to create your own dashboards containing customized charts and tables for any particular metrics. The documenation is very thorough and the help desk is also very responsive, so you should be able to pick up these features quickly once you get started. 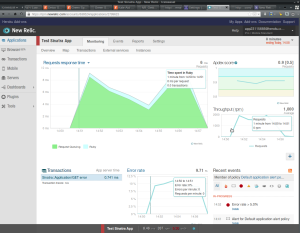 Hopefully this post has helped to demonstrate how New Relic helps you to monitor the performance of a Ruby application in real time and provides instant feedback as it happens. This allows you to respond quickly to any problems that might arise after an update. 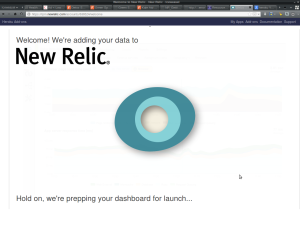 Are you already using New Relic? Are you thinking of trying it out? If you already use it, which metrics have you found most useful? Let us know in the comments below.